London’s oldest surviving Ashkenazi synagogue hasn’t held a Friday night service in so long that members can’t remember the last time someone sang the Sabbath hymn of “Lecha Dodi” in its ornate sanctuary. But when guests gather at the 143-year-old Sandy’s Row Synagogue in the capital’s East End tomorrow evening, they’ll sing the special liturgical poem and more, welcoming the dawn of the holy day before enjoying a fully catered meal at the neighborhood landmark. Rabbi Mendel Cohen, director of Chabad-Lubavitch of Shoreditch and rabbi of the Saatchi Synagogue in S. John’s Wood, has partnered with board members at Sandy’s Row to welcome Jewish students from surrounding colleges, old timers, young affluent residents, city workers new to the neighborhood and anyone else looking for an inspirational Friday night service. Local businessman Trevor Marshall is among those who can’t wait. Simon Greenberg, a 22-year-old filmmaker, introduced Cohen to Marshall. He compares what’s happening in the East End neighborhood of Spitalfields to the redevelopment and rebranding of urban neighborhoods like Brooklyn, N.Y.’s Williamsburg. Artists and young families, he explains, are invigorating the area. The filmmaker, who describes himself as secular, admits that he’s not much of a shul-goer and exclaims with amazement that since Cohen moved in, he goes to synagogue at least twice a month. And “I don’t feel any pain,” he jokes. 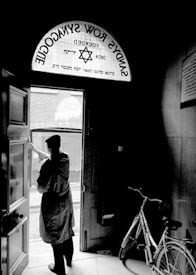 What matters to Greenberg is that the Jewish presence in the East End, where thousands of Jews lived and worked throughout the late 19th and early 20th centuries, remains. Leaders of the local movement underscoring the importance of this week’s historic service include 24-year-old photographer Jeremy Freedman. Like Greenberg, he lives in a Spitalfields flat and is passionate about revitalizing Jewish life; like Marshall, he serves as a member of Sandy’s Row’s board of management. “This whole idea came together in a matter of weeks,” he describes. “We are expecting between 30 to 50 people this first time, and we will do it every month for the next three months to see what happens. Freedman adds that the project is deeply personal. His ancestors founded the shul. Built as a Huguenot church in 1766, Sandy’s Row passed through the hands of a succession of denominations before a society of Jewish immigrants, most of them Ashkenazi Dutch cigar makers, diamond cutters and fruit traders, bought the structure in 1867. Other synagogues in the area protested the immigrants’ efforts and refused to participate in its renovations or dedication. Still, the Dutch workers hired architect Nathan S. Joseph to add a classical Georgian touch to the space with clerestory windows, coved ceilings and a neo-classical Torah ark. To accommodate east-facing congregants, he bricked up the original entrance on Parliament Court and opened a new one on Sandy’s Row. He also added a three-story building for offices and accommodations. In 1870, the rabbis of the Bevis-Marks Sephardic Congregation consecrated the building, and member families taxed themselves a penny a week to help pay off the mortgage. 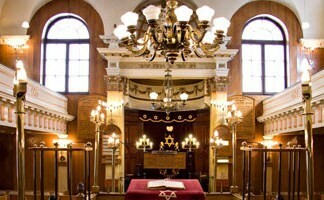 By 1881, the synagogue was one of the largest congregations in London. During World War II, the building survived the Blitz; today, it remains an independent congregation and is listed as an official British Heritage site. But while the synagogue survives largely unchanged, the local streets do not. The East End – where Cockney accents once flourished and Petticoat Lane hosted the largest prewar Sunday street markets – is now one of the most popular and fashionable places in the city. Its cobblestoned streets still charm, but the Yiddish shop signs have disappeared. Now, synagogue leaders want to cater to a new class of Jews with a wide range of religious, cultural and educational activities. They hope to capitalize on the structure becoming a major tourist attraction. For Cohen, who was born in Leeds and travelled the world as a Chabad-Lubavitch rabbinical student, the Friday night service is a chance to introduce locals to the engaging style of worship characteristic of Chabad Houses and his own Saatchi Synagogue. “There are about 10,000 Jews working in the East End and the City of London, and we are in a great location for Jewish professionals,” says Marshall. “Lots of Jewish students and some Israelis are moving within a one mile radius of the synagogue, and there are a number of trendy Israeli shops popping up here and there. My grandparents were married in Sandy's Row Synagogue and I did not know it still existed, it is very exciting to discover that not only does it exist but it is going to have future with a congregation. Mazel tov!